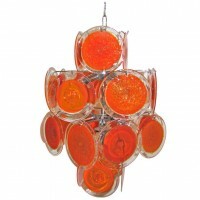 Vistosi hand blown orange glass disc 9 light chandelier with chrome frame, the glass discs alternate in 2 styles as seen in close up images. Uses 9 40-watt candelabra size bulbs. Rewired.